CHARLESTON, S.C. – As the young white man charged with murdering nine people inside an historic black church in South Carolina stood silently and expressionless at a court hearing on Friday, relatives of the slain worshippers faced him one by one, offering tearful words of grief and forgiveness. Felicia Sanders was said by a family friend, according to an interview with CNN, to have survived the shooting rampage by lying on the floor and playing dead as she cradled another survivor, her 5-year-old granddaughter, while her son’s blood soaked her clothes. Roof stared blankly, and glanced downward occasionally, as Sanders and four other family members of the gunshot victims spoke of how he had been welcomed into to the church by the nine people he has been charged with slaying. The attack at the church nicknamed “Mother Emanuel” for its key role in African-American history followed a wave of protests across the United States in recent months over police killings and excessive force against unarmed black men, focusing attention on race relations and bias in the criminal justice system. President Barack Obama, addressing the U.S. Conference of Mayors in San Francisco, said the latest shooting exposed the “blight” of racism still present in America, and he railed against critics who have accused him of politicizing a tragedy to talk about tougher gun laws. 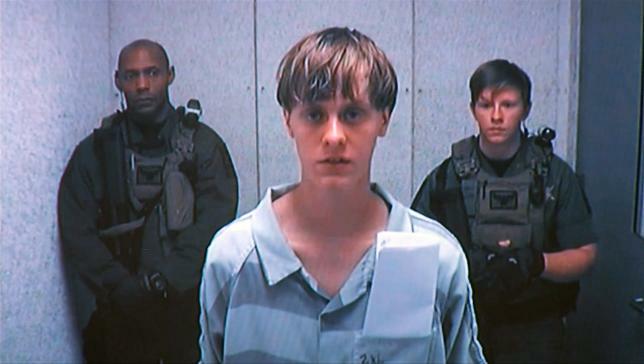 The victims’ family members filed into the courthouse in twos and threes before Roof’s appearance, appearing composed as they stared into the video monitor at the defendant, who was arrested without incident in Shelby, North Carolina, on Thursday after 14 hours at large. In addition to Tywanza Sanders, the massacre’s victims included Democratic state Senator Clementa Pinckney, 41; DePayne Middleton Doctor, 49; Sharonda Coleman Singleton, 45; Cynthia Hurd, 54; Susie Jackson, 87; Ethel Lance, 70; Myra Thompson 59, and Daniel Simmons, 74. The defendant’s relatives, in their first public comment since the shooting, issued a statement through Roof’s lawyer offering their “deepest sympathies and condolences” to the victims’ families. “Words cannot express our shock, grief and disbelief as to what happened that night. We are devastated and saddened by what occurred,” the statement said. “This was not merely a mass shooting, not merely a matter of gun violence, this was a racial hate crime and must be confronted as such,” said Cornell William Brooks, president of the NAACP. The National Association for the Advancement of Colored People was founded in 1909 to confront lynchings in the United States.